ATP World Tour Finals | ATP Deluxe Packages | Tennis Tour Packages - Steve Furgal's International Tennis Tours ~ Experience a Tennis Trip of a Lifetime! 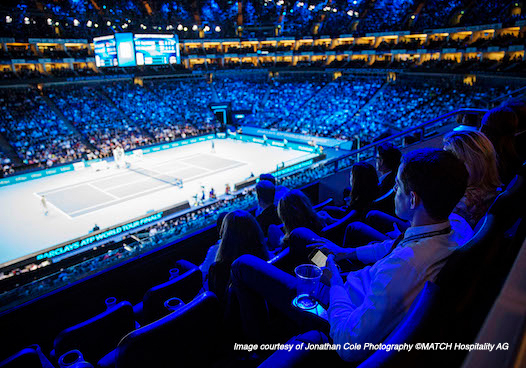 Steve Furgal's International Tennis is appointed as non-exclusive Sales Agent of MATCH Hospitality in North America for the sale of the ATP World Tour Finals 2019 Official Corporate Hospitality. The ATP World Tour Finals is one of the most prestigious tennis tournaments and is in London again this November! This event is the climax of the men's professional tennis season, featuring only the world's best eight qualified singles players and doubles teams. Hosted at The O2, here is your chance to experience the crowning of the ATP World Tour Finals Champion! The Canary Riverside Plaza Hotel, overlooking the River Thames, is a sophisticated and elegant five star hotel located in Canary Wharf, London's vibrant east-end. The hotel is a stunning example of modern luxury with an exquisite restaurant on the ground floor leading onto an open air terrace, along with the comforts of the lobby lounge and bar. Enjoy the upscale rooms that include limestone bathrooms and luxe linen, as well as free Wi-Fi, flat-screen TVs and minibars.